Banoffee Pie is pretty genius as is but I think the addition of Biscoff cookie crust and Biscoff whipped cream take it over the top. The hands-on time for this recipe is pretty minimal but the toffee does take 10 hours to cook and cool so plan accordingly. I promise, this is worth the wait! Remove the paper label from the sweetened condensed milk and place the sealed can in the bottom of your crock pot. Fill the pot with water until the liquid is at least a half-inch above the top of the can. Turn crock pot on to “low” and set for 8.5 hours. After 8.5 hours, turn off your crock pot so that the “warm” setting doesn’t kick on and walk alway until the pot is cool enough to handle safely. Place the pot into your sink (do not drain the liquid!) and run cool water into it for 5 – 10 minutes, until the can is cool to the touch. Place cooled can in the fridge for 1 – 2 hours so that it cools completely. Preheat oven to 350 degrees Farenheit. Place cookies into your food processor and pulse until you reach the consistency of rough sand. You can break up the cookies by hand by placing them in a large baggie and mashing with a rolling-pin, just make sure that you pick out any large pieces left in the mix. Put butter into an 8-inch pie pan and stick the pan into the preheating oven until the butter is completely melted. Remove pan from oven and pour cookie crumbs into the melted butter. With a fork, mix the butter into the crumbs and then use your fingertips to press the crust into an even layer in the bottom and up the sides of the pan. Bake for 9 minutes at 350*. Allow crust to cool completely before filling. You can do this by hand if you want an arm workout but it will be easier with a hand mixer and easiest with a stand mixer. Put your mixing bowl and beater into the freezer for 15 minutes so they get nice and cold. Pour heavy cream into chilled bowl and whip until stiff peaks are just about to form. Beat in sugar and Biscoff Spread until peaks form. Try not to overmix, but if the cream starts to get lumpy you can add a little more cream and rebeat. 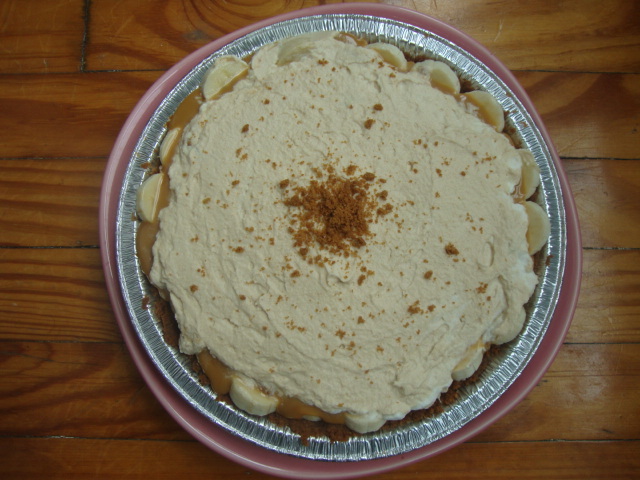 Place sliced bananas in a single tight layer in the bottom of the cooled Biscoff cookie crust. Remove sweetened condensed milk can from the fridge and carefully open it. Use a spatula to pour the toffee over the bananas, smoothing it out to the edges of the crust as needed. Use a clean spatula to top the toffee with the Biscoff whipped cream. Optional – crumble a Biscoff cookie on top of the whipped cream for a little flair. Place the pie in the fridge if not serving immediately. Pie will keep in the fridge for at least two days; I can’t attest to any longer than that because ours was all gone!